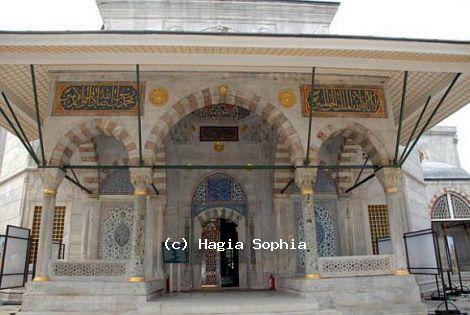 This building is one of the 18 tombs built by Architect Sinan. It has the most beautiful examples of stonework, woodwork, tiles and calligraphic arts. Architect Sinan got an order from Sultan Selim II to build a tomb for him. It is known that the tomb could be completed 3 years after death of Sultan Selim II. The facade of the building is coated with marble. Entrance door of the structure has inlaid mother of pearl which is known as Kundekari Style and decorated with geometrical tortoise shells which is an exclusive example of woodwork. Each side of the door has the tiled panels with purple, blue, green and red flower patterns which show 16th century tile workmanship. Left side of the door has replica tiles which has paler colour than right side ones because original ones were sent to France for restoration in 1895 and they are still in the Louvre Museum. There are a total 42 sarcophagi in the tomb belong to Sultan Selim II, his wife Nurbanu Sultan, their sons Osman, Mustafa, Suleyman, Cihangir, Abdullah, their daughters Fatma, Istemihan, Hacer and Guherhan and Sultan Murat III’s sons and daughters.